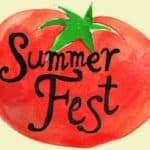 The Summer Fest party continues this week and the guest of honor is the cucumber. When I started thinking about what recipe to share today that would highlight one of my favorite summer vegetables, I came up blank. I don’t usually cook with cucumbers… I just love to eat them! I love them so much, I almost always have cucumbers in the fridge. I add them to green salads, summer salads, and a couple times a month they get sliced, doused in vinegar, and become a salad on their own. I also love slicing them into sticks for an afternoon snack. But you guys don’t need a recipe to do any of those things (although I have shared a quick cucumber salad recipe in the past). So, I started thinking about popular cucumber recipes I’ve never tried before and decided I would make a cold cucumber soup for dinner and share the results with you. Lots of recipes I’ve seen for cucumber soup include yogurt, but since I’ve been on a huge kefir kick lately, I decided to use that instead. I’ve actually been culturing my own kefir for a few weeks now and drinking it in a smoothie every morning. It’s delicious and I’ve been feeling great! I’ll be writing all about kefir soon and will share photos of the kefir-culturing process. If you are unfamiliar with kefir and/or can’t find it at your local store (it should be located in the dairy section near the yogurts), you can certainly substitute an equal amount of plain yogurt in this soup. The rest of the soup ingredients came together based on my own tastes and the ingredients I had on hand and I love the way it turned out. It’s cool and creamy, with just a hint of spice from the chile. I highly recommend stirring in a handful of chopped tomatoes at the end – the tomatoes add just the right amount of sweetness. I used my high-powered Blendtec blender to make the soup, so mine turned out perfectly smooth. Your blender might give different results, but the soup can always be strained if necessary. As always, I encourage you adjust ingredient amounts and seasonings to suit your own taste. Place all ingredients in a blender and process until smooth. Serve immediately or store in the refrigerator. 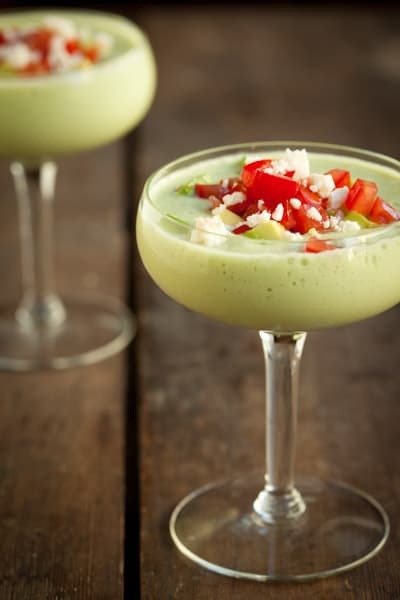 To serve, garnish soup with chopped tomato, avocado, cilantro, and crumbled Cotija cheese. Recipe notes: This soup tastes just as great the next day, so it’s definitely something that can be made ahead. I think this would be great served in shot glasses at a party. If you aren’t serving the soup with chopped tomatoes, I would add a tiny amount of sugar, honey, or agave nectar to the blender mixture (maybe 1/2 – 1 teaspoon) to help balance the flavors. Can't wait to hear about the kefir culturing!This is really random, but I got to thinking... do you measure yogurt in a liquid measuing cup or dry measuring cup? I would measure kefir in the liquid cup, but would do yogurt in the dry cup... and I can't imagine it would make a material different, but I'm curious and thought I'd ask.I'm going to try this, with some homemade creme fraiche and soft cheese. Looks great! Aloha Nicole! This looks delicious! We have hundreds of varieties of local avos and I am always looking for new ways to use them. We also have lots of local Japanese Cucumbers here~ another reason to try this recipe. And your photos in the morning light turned out great. Such a delicious post. I made some avocado smoothie today with basils. Next time, when I find untouched ripen avocados in the kitchen, I know this will be my next recipe to try.I would like to be a part of Summer fest. Is there any email to reach out? THIS. LOOKS AMAZING annnnd, like something I could make! cucumbers and avocados?!? one of my favorite combos ever! What a great recipe, perfect for summer! Light and refreshing, yet satisfying. That photo is stunning, so perfect in it's simplicity. You've inspired me...absolutely gorgeous photo. I've had avocade smoothie made by my French friend, but without the cucumber. Cucumber sounds very refreshing. I must try your recipe this summer. Thanks for your great site! You have made the soup looks so appetizing in the pic. And I definitely need this to beat the summer heat. I just found your site, and I am so excited to try so many of your recipes! You have a beautiful presentation. Thank you! What a delicious sounding and beautiful soup for easy summer entertaining. I'm always looking for something that can be prepared well in advance. Thank you! I have to admit that I have never combined cucumbers and avocados but this looks delicious!Since I own a Blendtec I just might have to try this recipe! Thanks for sharing. I've been culturing my own kefir for a while and have become a real kefir evangelist. It's so healthy. I love this recipe and will definitely try it. That! I needed this recipe earlier today when I was in the mood for a chilled soup! Sounds fabulous and I can't wait to try it this week. Thank you! This recipe looks great and refreshing. Definitely bookmarking this one! Thanks for sharing. This looks absolutely divine. Awesome for when the weather is hot. Looks like a great summer recipe, I love the comination of cucumber and avocado. Thanks for sharing! Wow this recipe looks scrumptious! And I've never heard of kefir until now. I'm very intrigued. Definitely adding this to my to-do list. Thanks for sharing! I love this... Where does a fellow go grab a couple of those?, I'm going to recommend it to some of my friends . wow... thats very cool. Creamy Chilled Cucumber and Avocado Soup,sounds good.And photographs are wonderful. Chilled soups are great - this one is, too! Great recipe! I *love* chilled avocado soup. What a great flavor combination for a soup! Yum. Sounds like an amazing spice…where exactly in Fresno did you find it? The key is ground cumin. Love the flavors of yogurt, cucumber and cumin. We in India make a cold salad, Raita, using cucumber, yogurt, green chilies, cumin and fresh coriander. Soothing to the soul! Gorgeous picture. :)Btw, love your space. Beautiful. Wow, what a cool recipe, i really need to make it on my own, thanks for sharing it here. I bet this is awesome. I'm gonna try this one tonight on the guinea pigs *cough* eh-hem... Family, I mean.